Start off your visit on the 9th (Tue): Head underground at Syvasenvaara Fell, stop by LAURI, and then experience the excitement of Feelapland. To find traveler tips, other places to visit, photos, and tourist information, read our Rovaniemi trip planning site . Darwin, Australia to Rovaniemi is an approximately 28-hour flight. You can also do a combination of flight and train; or do a combination of flight and bus. Due to the time zone difference, you'll gain 7 hours traveling from Darwin to Rovaniemi. When traveling from Darwin in July, plan for much colder days in Rovaniemi, with highs around 22°C, while nights are a bit cooler with lows around 13°C. Wrap up your sightseeing on the 9th (Tue) early enough to drive to Inari. 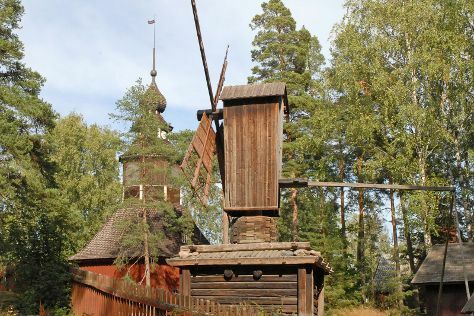 On the 10th (Wed), see the interesting displays at Siida, then take in the architecture and atmosphere at Pielpajarvi Wilderness Church, and then get interesting insight from Tours. For reviews, maps, and other tourist information, go to the Inari itinerary planner. You can drive from Rovaniemi to Inari in 4 hours. Other options are to take a bus; or fly. In July, plan for daily highs up to 20°C, and evening lows to 11°C. Wrap up your sightseeing on the 10th (Wed) to allow time to travel to Helsinki. Kick off your visit on the 11th (Thu): take in the spiritual surroundings of Rock Church, steep yourself in history at Seurasaari Island and Open-Air Museum, learn about all things military at Sea Fortress Suomenlinna, then pause for some serene contemplation at Helsinki Cathedral, and finally explore the world behind art at Kansallisgalleria. Get ready for a full day of sightseeing on the 12th (Fri): contemplate in the serene atmosphere at Uspenskin Cathedral (Uspenskin Katedraali) and then surround yourself with nature on a nature and wildlife tour. For reviews, photos, traveler tips, and other tourist information, go to the Helsinki trip itinerary planner . Getting from Inari to Helsinki by flight takes about 4 hours. Other options: drive; or do a combination of bus and train. Prepare for a bit warmer weather when traveling from Inari in July: high temperatures in Helsinki hover around 25°C and lows are around 15°C. Finish up your sightseeing early on the 12th (Fri) so you can travel back home.